This statement also applies to the Bill and Melinda Gates Foundation’s corporate education reform policies. We at Teachers’ Letters to Bill Gates and the following signers hereby assume that the Bill and Melinda Gates Foundation experts are motivated by a sincere desire to improve education. But we fail to understand how your organization has become the national and global arbiter of the means and ends of education in the United States and around the world. The Bill and Melinda Gates Foundation’s narrow focus on standardized testing risks turning learning into drudgery and killing the joy of learning. As the Gates Foundation’s national and global push for the Common Core, high-stakes testing, and teacher evaluations based on test scores has led many governments into a national and international competition for higher test scores, the Bill and Melinda Gates Foundation has assumed the power to shape education policy in the United States and around the world, with no debate about the necessity or limitations of the Bill and Melinda Gates Foundation’s goals. We are deeply concerned that measuring a great diversity of educational traditions and cultures using a single, narrow, biased yardstick could, in the end, do irreparable harm to our communities, our schools, our profession, and our students. We the undersigned reject the Bill and Melinda Gates Foundation’s tight control of education policy. Venture philanthropy’s influence on public education has been all-pervasive and we demand an immediate restoration of democracy in our schools. Divest from corporate education reform. Cathleen Calderone Montilla, Special Education Teacher 28 Years! Angela De Scalzo, 20 Year Veteran Teacher -How many years in education do YOU have Mr. or Mrs. Gates?? Candace Lawrence, I’m a successful AP English teacher in a low-income school, and I’d like to know why “Bill and Melinda” (like they’re our best friends) don’t offer their largesse to cancer research or–someplace where they might actually be able to do some good–instead of throwing their considerable weight around in a field they clearly know nothing about. Paula Johnson, I am a 4th generation, now retired, educator and I have never witnessed such greedy predators targeting America’s students. Saddest part is the government is giving their blessing so personal legislators can profit. Shameful!! Michael P. Dominguez: Your policies have given school administrators nationwide the cover that they need to make decisions about personnel based solely upon payroll costs while claiming that they are protecting children. The best example of this is the LAUSD where Gates clone Mr. John Deasy has orchestrated a 20% increase in administrative positions and pay while firing thousands of veteran teachers based upon false charges of incompetence and child abuse. The GatesBroadWalton agenda is so pervasive and the power of your money so corrosive that the media cannot and will not cover this. The evil that you perpetrate will attach to your name forever. Laurie Krause Taylor, Parent, public school teacher, taxpayer, citizen. I disagree with every educational policy you have funded. STOP using your wealth to circumvent democracy! Leave our children alone! Karen M. Fraid, Chicago, IL. Public School parent, Arts Educator, student, Local School Council member, former PTA officer, and advocate for non-traditional learners and at-risk youth. Signing because true philanthropy never has strings attached, especially when children are involved. Julia C. Vassilatos, Chicago IL. Masters in Religious Studies, Divinity School, University of Chicago. Public school parent, former Preschool Teacher, former Local School Council member, former PTA officer, advocate for Deaf and hard of hearing children and programs, Art Educator, public school advocate and education blogger. Your work in education is causing untold harm that you will never see because your children, who are not in the public schools, will never experience the problems you have caused. Omar Sangiovanni, Father. Husband. Printmaker. Artist. Art Teacher. DeeAnne Bennett, MS Social Studies Education, I.B. Certified, NBPTS Social Studies AYA, 24 years in classroom experience! Erica DuBois, NJ BAT (14 years and counting in an urban public elementary school) and parent of 2. Elizabeth Rubenstein, Art Educator, Pacifica, CA – Children are neither standard, nor common. Nancy Malsom, Iowa Middle School Special Education Teacher from 1982-current, MA in Curriculum and Instruction, BS in K-8 education with endorsements in reading, learning disabilities, mental disabilities, behavioral disabilities, Level 1, self-contained, self-contained with integration, and multicategorical resource. Josh J. Middleton, Ed.D. American public education has deep roots and proud heritage in local control. Any attempt at deep change must include the stakeholders who have students and student learning interests the top priority. Ed reform does not work with top down directives. Wanda L. Horne, Special Education Teacher, Pulaski Country Special School District, Little Rock, AR.. Your changes have dealt a blow to special needs students that is actually worse than the disability they have. I’m afraid this could be irreparable damage to a group that is already behind in so many ways. Shawn DuFresne, Parent, Grandparent and husband of a hardworking public school teacher! Janet Demers, Retired Teacher, B. Ed in Education, M.Ed. in Reading from University of Massachusetts, taught for 34 years in public schools. I am against the corporate take-over of public schools, high-stakes standardized testing, teacher-bashing, Department of Education officials who have little or no experience as educators, and robbing children of joyful, hands-on learning. Eileen Glynn, Art Teacher for 25 years, mother to 4, mother-in-law to 3 teachers and grandmother to 6 present and future public education students. I am committed to working for quality education that hasn’t been deformed by those with monetary interests and without knowledge from long term experience in education. Those with direct teaching experience need to lead not those who only have inexperienced opinions and limited outside experience. Warren Williams: Stick to health care. Donna Saragnese, Middle School Math Teacher, parent, taxpayer. Stefanie Norris, MSpEd. — Bill, you should stick to what you know…..and it isn’t education! Jamy A. Brice-Hyde, Public school Teacher, parent, educational activist for public schools, human rights, and the eradication of poverty. Teresa Kiedrowski, Parent & High School Teacher: Divest now, Bill & Melinda! Laurel M. Sturt, author of Davonte’s Inferno: Ten Years in the New York Public School Gulag. Terri Graham, retired Arts Educator 32 yrs teaching in a large northeast urban school. Mr. Gates: explain again where you received your degree in education…..& how many years experience do you have teaching in a public school classroom. Laura M. Longhi, MAT, 20 year science teacher, math and science upper elementary lead teacher, math and science on-site school specialist Pre-K through 8th, concerned citizen, member BATs, Illinois BATs and BATs Prisons to Schools. A true philanthropist doesn’t push agenda based on his or her ego and desires and tie giving to said agenda. A true philanthropist listens to the experts, learns about the needs from these professionals and then gives to actually improve upon a situation. In this case, those that should be listened to are professional educators. Give it a try. You might learn something. Lorraine Naggi, The elite would never subject their kids to this nonsense, so why is it acceptable to subject everyone else’s kids to this? Our children will not be cogs in the machine, or serve as your children’s underlings to be dumped on and further disenfranchised! Lisa Harris, I have a Ph.D in education. I’m a 20-year veteran high school English teacher and adjunct professor. Arthur S. Getzel, 36 years as a Public School Teacher New York City Department of Education, soon to be retired. Newark Students Union: The Newark Students Union is an organization founded by and for Newark students with the goals of protecting student rights, ensuring we receive a quality education, and empowering the student voice in the political process. Michelle McFadden DiNicola, Our committed group of parents in Highland Park support you in the divest quest! Bill Gates was not elected to anything & he is no Demi-God. Amber Tyndzik, MEdT, 5th grade teacher in Honolulu, Hawaii. I have conducted thorough research on high-stakes, one-size-fits-all testing and its effects on our students and teaching practice. My master’s thesis was written on this topic. As a 5th grade teacher, I also have personal experience of the emotional distress and anxiety it causes my students. Bottom line, the Common Core, along with its high-stakes testing component, does not only negatively affect teaching practice, but it also does not give an accurate measure of student achievement and is causing unnecessary stress and anguish in our young people. Sue Snizek, Mom of 8 grown people all working all graduated all had that old time education you 2 + 2 is 4!!!! Get out of the education game !!! 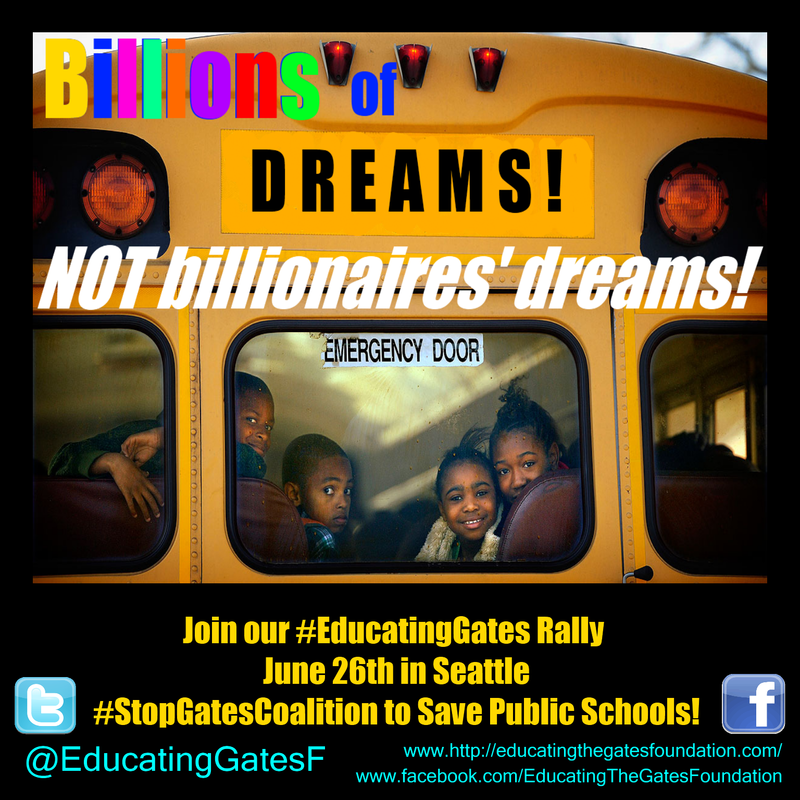 Lynnda Butler: The Gates Foundation has no business sabotaging education!!! Kirsten Pannek, M. ED., teacher, and parent of a son who attended public school. My son and I both left public school because of Bill Gates’ influence on curriculum. Bill and Melinda Gates need to keep their money. Theresa Patane, Educator, Union member, public school parent: Our once great nation is being undermined by corporations, and the fact that corporate interests seem to matter more than those of the average citizen. Melanie Meridith: Bill and Melinda, you need to stop trying to control everything! You two are not GOD! Jackie Craig, Ms Ed, Counselor Education: We need equality in education – the great equalizer – to strengthen our communities. To obtain equality, we need to remove profit making entities who cherry pick those they feel are most likely to succeed. Deb Hansen, If our wish is for this great country of ours to remain a democracy then corporations and special interests such as the Gates Foundation should stay out of the business of educating. I have no desire to live in an oligarchy – neither should you. Scott and Amanda Schulte- Parents of a child with special needs. Warren Williams: Stick to your world health care improvement & leave education to those who actually know something about education. Please consider substitute teaching in a high-need school corporation for a week (without publicity and advance notice to the press or the public). Once you see where children and their schools need help, you might change your educational philanthropy so that more aid be given to CHILDREN and SCHOOLS rather than to organizations and so-called “leaders” of educational reform. Z. Amansky, A 24 year veteran high school computer science teacher that’s prepared… just the type of student that Mr. Gates’ company would hire agrees 100% with this letter. Edward B. Cook, WA Resident: Budweiser or craft beer? Beer and education are best crafted by hand in small batches. Embrace your inner PEMCO, Gates foundation, and be a little bit different. Zen Q.I. : Please add my signature to your petition. I am a mother of a dyslexic child and we do not need the Gates to dictate to us how to educate. Shame on you Bill & Melinda Gates!!!! Martha L. Greene: You need to listen to the many educators that are telling you that we are heading in the wrong direction with these reform policies. I am a well respected educator that has been in the field for 37 years! I am not lazy but I am very concerned that you equate educational knowledge with money! Elsie Berry: Collaborate with TEACHERS and child development EXPERTS who VOLUNTEER their input and expertise. Joanne Godfrey: My students, as well as my teaching, are not a microsoft program that you can sell and make a profit from – you may be the richest man in the world, but you are dirt poor when it comes to dictating anything related to education. I don’t want your money, period. Sincerely, Joanne Godfrey, 26 year Kindergarten veteran teacher and master teacher with student interns via 4 major colleges in my city. Jennifer Guerrra: Shame on you! Susan Lee Schwartz: We know what you are doing. You are ending democracy by ending public education WHICH IS A Crucial INSTITUTION. INSTITUTION! Not schools! Word choice makes all the difference. An institution is at the root of a society! “School” is your shill- Duncan’s jargon, just as ‘teaching’ is the word he uses to replace the crucial ingredient… LEARNING! You twist the language and substitute “slogans” that sell magic elixirs… CHARTER SCHOOLS disguised as CHOICE. Orwell’s double-speak! There are real, insidious forces in motion, visible to anyone who is looking, and we are looking at YOU! This entry was posted in Demand to the Bill and Melinda Gates Foundation, Divest from Corporate Education Reform and tagged Alfie Kohn, Badass Teachers Association, Bill and Melinda Gates Foundation, Bill Gates, Billionaires, billions of dreams not billionaires' dreams, Carol Burris, Corporate Education Reform, David Berliner, Diane Ravitch, Edreform, Educating Gates Foundation Rally, Educating Gates Rally, Henry Giroux, High Stakes Testing, Mark Naison, Melinda Gates, Noam Chomsky, OECD, Organization for Economic and Cooperation Development, PISA, PISA Test, Standardized Testing, Stephen Krashen, Teachers' Letters to Bill Gates, venture philanthropists, venture philanthropy, Washington Badass Teachers Association, Yong Zhao. Bookmark the permalink. 365 Responses to We, the undersigned, demand the Bill and Melinda Gates Foundation divest from corporate education reform. Speech & Language Pathologist, public school speech provider & mother of a student in the public school system. Thank you, Monica! We have added your signature to our letter! Divest now, Bill & Melinda! Thank you, Teresa! We have added your signature to our letter! Thank you, Kristen! We have added your signature to our letter! Mr. Gates: explain again where you received your degree in education…..& how many years experience do you have teaching in a public school classroom. Terri Graham, retired Arts educator 32 yrs teaching in a large northeast urban school. Thank you, Terri! We have added your signature to our letter! Thank you Laura! We have added your signature to our letter! The elite would never subject their kids to this nonsense, so why is it acceptable to subject everyone else’s kids to this? Our children will not be cogs in the machine, or serve as your children’s underlings to be dumped on and further disenfranchised! Thank you Lorraine! We have added your signature to our letter! Thank you Janet! We have added your signature to our letter! Thank you Stephani! We have added your signature to our letter! I have a Ph.D in education. I’m a 20-year veteran high school English teacher and adjunct professor. Thank you Lisa! We have added your signature to our letter! Thank you, Lisa! We have added your signature to our letter! Aneva Williams…. Grandparent and school bus driver. Thank you, Aneva! We have added your signature to our letter! Thank you, Rose! We have added your signature to our letter! Thank you, Arthur! We have added your signature to our letter! The Newark Students Union is an organization founded by and for Newark students with the goals of protecting student rights, ensuring we receive a quality education, and empowering the student voice in the political process. Thank you, Kelly! We have added your signature to our letter! Thank you, Sue! We have added your signature to our letter! Thank you, Kirsten! We have added your signature to our letter! Thank you, Jody! We have added your signature to our letter! Thank you, Cathy! We have added your signature to our letter! Our committed group of parents in Highland Park support you in the divest quest! Bill Gates was not elected to anything & he is no Demi-God. Thank you, Michelle! We have added your signature to our letter! Do you have other parents from Highland Park who would like to sign? Thank you, Amber! We have added your signature and your note to our letter! Thank you, Pamela! We have added your signature to our letter! Sue snizek mom of 8 grown people all working all graduated all had that old time education you 2t2 is 4!!!! Get out of the education game !!! Thank you, Mandy! We have added your signature to our letter! Thank you, Tr. Kerry! We have added your signature to our letter! The Gates Foundation has no business sabotaging education!!! Thank you, Lynnda! We have added your signature to our letter! Thank you, Betsy! We have added your signature to our letter! Early Childhood Educator, 18+ years experience in public schools, Masters Degree in Early Childhood Education. Thank you, Lynn! We have added your signature to our letter! Thank you, Angela! We have added your signature to our letter! Thank you, Carmen! We have added your signature to our letter! Our once great nation is being undermined by corporations, and the fact that corporate interests seem to matter more than those of the average citizen. Thank you, Theresa! We have updated our letter to include your signature! Stick to your world health care improvement & leave education to those who actually know something about education.